The shoe flower is so beautiful n I love shoe flowers!they come in brilliant n rare colours!the easiest plant that can grow in any garden without much care!God's gift to the world! Make more people stay with us! But we can be often if not always. That makes the life happier n peaceful! 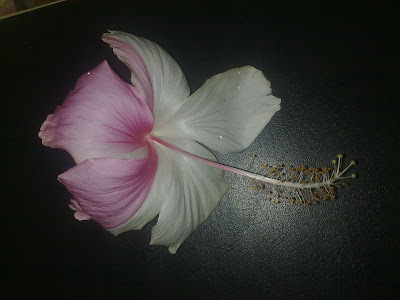 Beautiful pic!nd the black background of ur blog sets off the loveliness of d flower so well...accentuates its beauty! thts the real color of the flower?? its beautiful!! i knew about the black :P and pps,but when you are so determined to let go, its such an easy job dear trust me, you can walk away even without a word ! Thats beautiful.. i have never seen a multi coloured sunflower.. !! enjoy life.. n be happy! if u are sad i know i will find poems here which will make me cry :) so be happy always..